I am as well fluent in both French and Spanish. feel free to contact me in any of the 3 languages. I am a Superhost in my other listings on other websites with websites with an average 5 stars ratings of 88%. The apartment is on the Second floor (first floor for Europeans) of a 3-family house building. It has 3 separate rooms all with windows, a huge living room, dining area, kitchen and 2 full bathrooms. The master bedroom has a king size bed and its own bathroom. The remaining two rooms have each a Queen size bed and share the other bathroom. It Is full of natural lights, spacious. All new appliances and furniture! Clean comfortable and it will allow you to fit nicely up to 8 people. Free 1 parking spot for Jan and Feb, Need to reserve it at booking. First come first served. The Building is fairly new. The house faces a garden and is quiet and clean. The entire apartment is reserved for the Guests and is at their disposition. They are not sharing anything in the apartment with no one else. There are a lot of storage room which makes it very convenient for both long and short stay! The G train is less than 5 minutes walking distance (3 blocks). JMZ trains are 10 minutes away walking distance. Lower Manhattan is 15 to 20 minutes away. This apartment is located right above my first listing. You can refer to all the reviews in that listing related to easy access to Manhattan and to the other boroughs using either public transportation or your own car. I am always available, either on the phone, emails or physically to help. I do have employees as well that are available to make your staying lovely. In the morning, you can grab coffee and croissants at an upscale coffee shop BKLYN Blend and commingle with your neighbors, sit and enjoy your coffee, relax and check your emails. It is one block and half right before the corner of Tompkins and Dekalb. The Famous Italian Pizzeria Rocco Pizza is next door. Go Groceries shopping to Bravo Supermarkets it is at walking distance (7 minutes) on Dekalb Avenue between Throop and Marcus Garvey or go to Food Bazar it is at walking distance at the corner of Broadway and Myrtle (10 to 15 minutes). Within walking distance at the corner of Myrtle avenue Nostrand “750 Myrtle Dinner” that’s a high end Asian restaurant and couple very nice bars/ restaurant with American food right next from it. Brooklyn Stoops is my favorite as it has very Tasty Burgers and a good selection of beers. Walking further on Myrtle and Classon stop by “Brooklyn Tap House” a huge sport Bar with good food and large selection of beers with large screen TVs to watch all types of sports events. Go furthermore on Myrtle Avenue you can find any type of restaurants and bars. Or just take the G train to Fulton Street Station you will be within 5 to 10 minutes maximum in downtown Brooklyn where there are a lot of restaurants, cafes and bars to choose from. Also, you can find out there almost all of the major brand store names at the Brooklyn Mall to find out there almost all of the major brand store names at the Brooklyn Mall or Fulton Mall to satisfy all of your shopping needs and to top it all the Barclay Center (Brooklyn Nets) is nearby. My favorite Steakhouse is St Anselm on Metropolitan Ave. Good quality with reasonable prices. Make sure to make a reservation before leaving the house otherwise it is unlikely that you will get in or will have to wait at least one hour. Be respectful of the other Guests or tenants in the house. Keep the noise down and be nice to others. The building is equipped with surveillance cameras. The High costs of living in Manhattan along with the low commuting time and easy access to Manhattan attract a lot of people in Bedstuy who would otherwise been living in Manhattan. The Building is located at the beginning of Bedstuy bordering both Williamsburg and Clinton Hill. The population is very diverse and constantly growing. The new constructions, Renovated buildings and new businesses are changing the whole environment and atmosphere. It is as New Yorkers would say keep more money in your pockets, live in a quieter apartment with far more space and comfort, in exchange for an extra 5 or 10 minutes daily commute to Manhattan as Manhattan is nearby. The house is within walking distance of two Police Stations, with a large number of police cars, walking or on bicycles on uniforms and undercover officer in the area. Hello, I am a Certified Public Accountant/Certified Fraud Examiner during the day and a grand-vivant at night. I speak English, French and Spanish. I lived and visited Europe, Africa and few Caribbean’s islands. Asia is next on the list. So, be ready to share your travel stories with me. A few things your soon to be pad: Myrtle-Marcy area is an easy commute, very diverse and full of things to do. Walk for less than 5 minutes (3 blocks) to the G train and several bus lines taking you anywhere in NYC. Manhattan is 15 to 20 minutes away. The commute to both JFK, LaGuardia and Newark is very convenient. Several different types of restaurants and bars on Myrtle Avenue giving you a variety of choices of dishes: Asian, Spanish, Caribbean and American. The apartment has hardwood floors. All new appliances and furniture! the living room has a large couch with a queen sized pull out bed. That creates an extra bed. Full kitchen with all brand-new appliances will allow for you to cook comfortably. The house is quiet, clean, full of light, and currently occupied only by professionals. Feel like home. At no charge, you will have a High-powered Wi-Fi, full cable. I am fluent in both French and Spanish. The Building is fairly new. The house is located in a very nice and quiet residential area with surrounded with brownstones and trees. All appliances and furniture are brand new. You will not be sharing anything. You have a Living-room, fully furnished kitchen area, and dining room. There is a TV, cable, with Free Netflix. You have clean Bed sheets, towels, and cleaning supplies. Be in a comfortable place called home away from the noise to just relax, regroup and rest! Laundry station available half a block from the house or 1 minute walking distance. Free parking spots on my driveway. Must be reserved. First come first served. Very comfortable with new furniture and very spacey with a 55"Flat screen TV. Fully furnished allows you to cook any dish of your choice. With fancy, spacy and very comfortable Chairs. Rent Citibank bikes one street over . For additional services just ask the Owner and we will work with you. Absolutely loved our stay and the owner is a delight to work with!!! We would definitely return!!! The home was exactly as promised and very enjoyable to stay at. It was nicely furnished and everything we wanted was there. Everything worked as it should and felt clean and cared for. The owner was easy to work with and very responsive and kind and accommodating and clearly wanted to be sure that our stay was enjoyable. It definitely was!!! The location was near the subway. We were not familiar with the NYC subway system but it was easy to learn and we used it every day. I would highly recommend choosing a place close to a subway station. Home was cozy and in a good location. 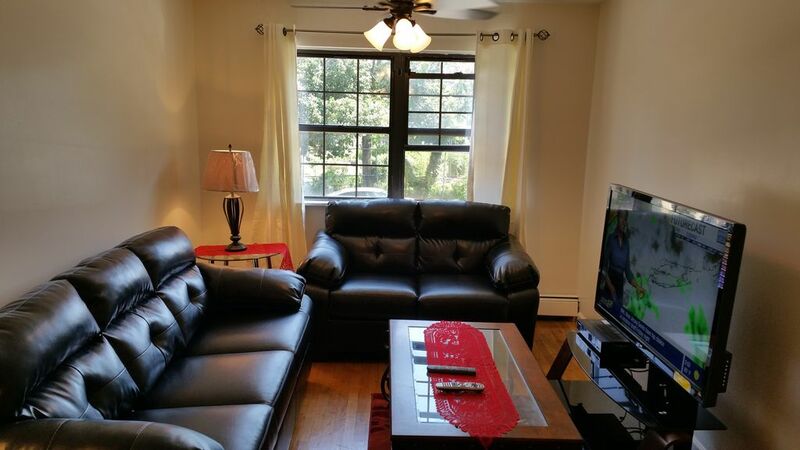 Home is located in a good location with lots of great restaurants and amenities near by. Lots of places near walking distance and only minutes away from the subway which was very convenient since we were back and forth from here to the city. This was our very first trip to New York and we enjoyed every minute of it. The location made it easy for us to commute via subway to the city to do all the tourist things we did. The host for this property made it very accommodating and was easy to get in touch with. He is very professional and thorough. Also his cleaning crew was very friendly and when needed, they responded quickly. I would definitely recommend this property if staying in Brooklyn. You Welcome Anne! We are very pleased that we were able to meet your expectations.